So I got invited to visit Chile and Argentina early this spring, right at the beginning of harvest in the Southern Hemisphere. I leapt at the chance. No matter that I was invited by one particular company, Montes. They are known for experimenting in the vineyards, and I wanted to see what was new. Instead of simply planting and training the vines in the current fashion, Montes looks at tradition and potential, as well as vine density, water requirements and other factors specific to grapes grown in the harsh climate of the Andes foothills. 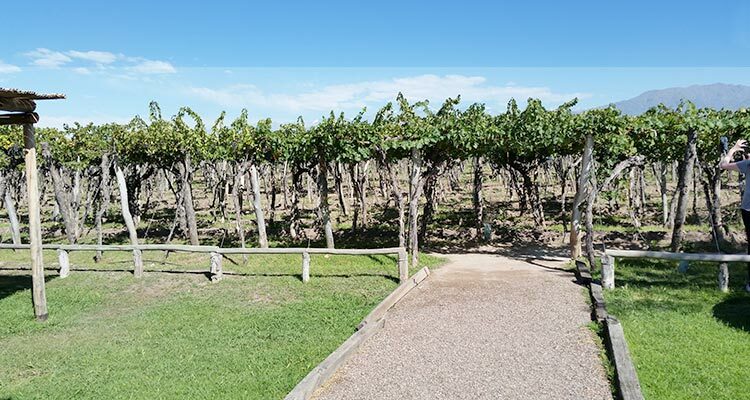 For example, they grow some grapes in Argentina’s old-fashioned pergola method, some with bush vine training on single stakes, and still others using several types of modern trellising, pruned with various numbers of shoots. Montes founder Aurelio Montes, Sr. pushes the envelope when it comes to vineyard placement and viticultural practices. Having worked for a Chilean wine producer in the 1970s and 80s, he traveled enough to notice that there was a major difference between Chile’s winegrowing practices and those of the Old World. He observed, for example, that in Europe, the best grapes were grown on hillsides. In Chile, growers tended to stick to the flatlands: easier access for everything from planting to pruning to harvesting – but generally leading to high production grapes with lower quality wines. Montes, then, began by planting his vineyards on desert-like slopes where there wasn’t enough water to grow anything. Of course this made the land affordable, which was critical to his startup company. Watering is expensive. But stressed grapes make the best wines, so he worked to discover the exact amount of irrigation needed. Even today, this continues to be a learning process, factoring in type of grape, soil, micro climate, and weather. The company is always teetering on the edge of using as little (costly) irrigation as possible, while ensuring the plants won’t shut down completely in this arid climate. In fact, in some of the vineyards, the leaves were so dry and close to withering that it actually made me uncomfortable; I wanted to run over and turn on the irrigation tap. The grapes, on the other hand, were delicious, and due to be harvested within days. In Chile, it’s not only about heat. Looking to produce alternative styles, Montes plants in the cool areas north of Santiago, and further west, toward the sea. There, the glacial Humboldt Current rushes up the coast, cooling the Pacific to un-swimmable temperatures and creating an ideal atmosphere for cool-climate wines. Who is responsible for all these vineyards? Aurelio Montes Jr. — son of Montes Sr. — of course. The Forty-ish vintner was the original winemaker at Kaiken, which Montes established in Argentina in 2001, when the world was demanding more Malbec. I do like the fact that – instead of creating everything new – they bought a winery built in 1920, and still produce Kaiken wines in this historic location today, using grapes grown in several areas of Mendoza and Salta. Though Kaiken also has its share of water problems, this area of Argentina has a long history of managing run-off from the Andes. Montes Jr. recently moved back home to take over winemaking in Chile. At this time of the year (near harvest), he is a perpetual motion machine, covering thousands of miles a week in his truck, and walking up to 10 miles a day among the vines. He seems happiest here in the vineyards, striding a few yards, inspecting the bunches, plucking a few grapes to taste, checking the seeds’ ripeness, squeezing the skins for a quick color analysis. Then moving a few more yards down the row to do it again. And again. And again. 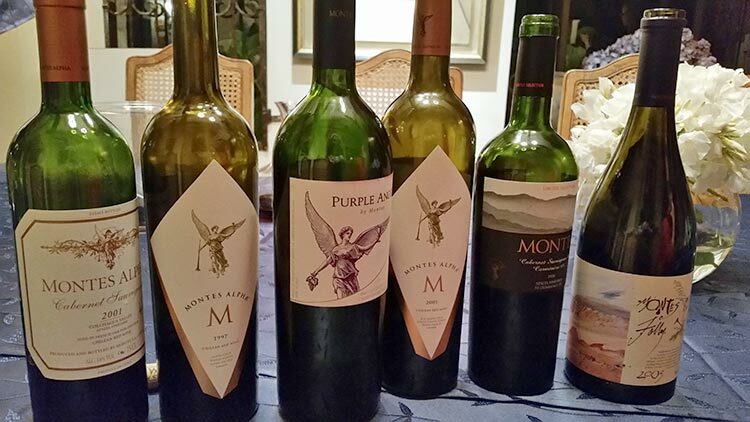 Montes Jr. and his viticulturists continue to experiment in both Chile and Argentina. They are working on programs to accustom the vines to “dry farming” or “subsistence watering” (which really means “bare subsistence” watering). 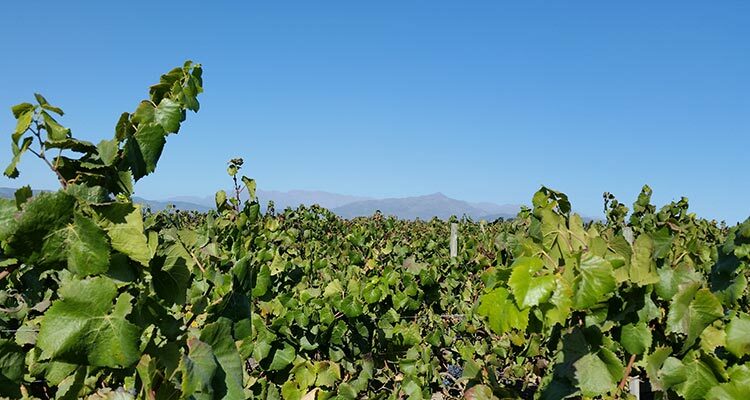 Among other trials, in Chile Montes has a small area where vines are covered with the same fabric used by nearby farmers to shelter fruit trees, in order to prevent full-scale water evaporation in the heat of day. To optimize vineyards for winemaking, Montes continually tests many different methods — whatever they can think of, or have seen in other countries. Green harvesting, heavy leaf pruning. Hand harvesting and hand-sorting grapes. Sustainable and even biodynamic practices. In one winery, Gregorian chant floats through the barrel ageing cellars. This same winery is also designed according to the principles of feng shui – not for the wines, but to make the people who work there happy. And my personal favorite, which I saw in both Chile and Argentina: using flocks of sheep, llamas and ducks to keep down the growth of grasses and weeds in between rows of vines. Among other wines, Kaiken currently produces several lines of well-crafted Malbec, available in the US, that range in price from Riserva around $10, to Ultra around $20, to Mai at $80. They also produce a sparkling wine and several Cabernet Sauvignons, not all of which are currently distributed in the US. In Chile, grapes grown at Montes include whites like torrontes, sauvignon blanc and chardonnay; and reds such as syrah, pinot noir, cabernet, carmenere, merlot, and malbec. The result is a collection of nearly twenty different still wines, under several labels, with a wide range of pricing but mainly in the premium and ultra-premium categories. They also produce a nice sparkler: Sparkling Angel, which I hope reaches the US soon. 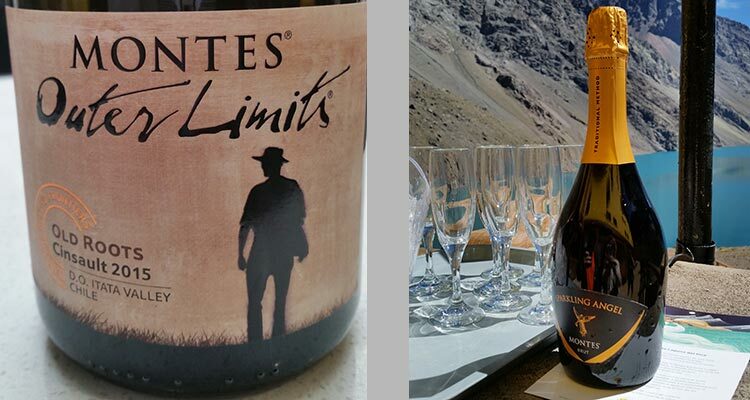 In addition, I like Montes’ Outer Limits range, which is just starting to be available in the US. A more experimental brand – as one might guess from the name – it includes a variety of styles, all in smaller production lots. For instance, one features old vines cinsault, and when they say “old vines,” they mean it. These Chilean grapevines are grown on their own roots, not grafted onto American rootstock — like most of the rest of the grapes in the world — because, astoundingly, the phylloxera plagues of the late 19th century and later 20th century did not take hold in Chile.